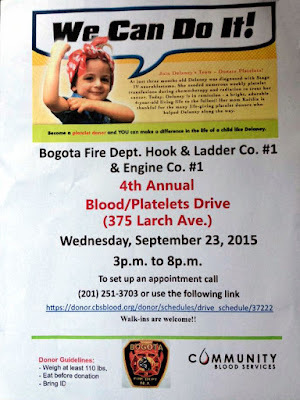 The Bogota Volunteer Fire Dept Hook & Ladder Co. #1 and Engine Co. #1 will hold their fourth annual Blood & Platelet Drive on Wednesday 23- September. This event will take place at the West Broad St. Firehouse next door to the Police Headquarters. 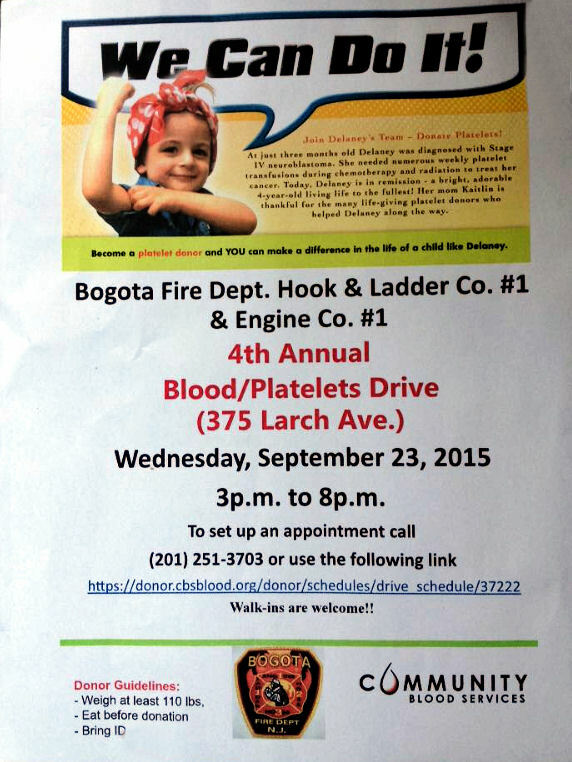 The drive will start at 3:00p and go to 8:00p, and is being co-sponsored by the Community Blood Services. Along with the collection of red blood cells as well as blood platelets. The blood cells are used for transfusions for anyone who need to replenish their system due to an accident or surgery. Platelets are use to aid in blood clotting that are use for those going through cancer treatments , or organ transplants. Anyone may donate if the are between 17-75 years old, in good health, and weigh at least 110 lbs. 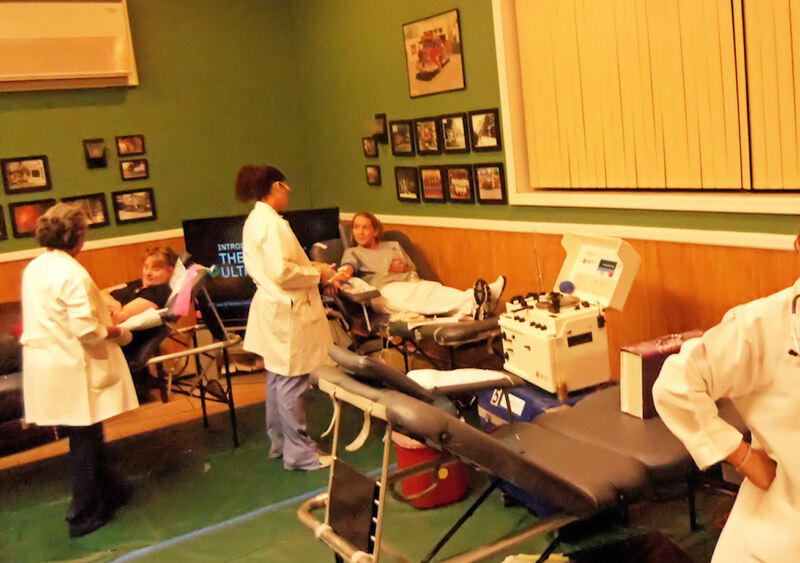 A donor is accepted even if they are prescribed medications that are frequently taken, inform the staff of all medication being taken, and it is recommended that a donor have a good meal , and plenty of fluids prior to donating. On Sunday 20 September the Bogota VFW post 5561 Hall will host a Concert (Ceili) by the Mike Rafferty-Joe Madden C.C.E. Branch. This will start at 3:00p and go until 6:00p. Scheduled to perform are Eileen Goodman, John Kennedy, Dan Gibney, and Gerry Kennedy. All musicians in attendance are always welcome to sit in. The Bogota Bucs Soccer team won its first game of the season with a 5-1 victory at Palisades Park. Bogota took a 2-0 lead into halftime with goals from Nico Calabia and Conor McDonnell. Bogota extended their lead to four in the second half on the strength of goals by Colin McDonnell and another by Conor McDonnell. Yeison Puluc of Palisades Park stopped Kazuki Garay effort at a clean-sheet with the Tigers only goal. Conor McDonnell finished his hat trick before full time to give the Bucs a 5-1 victory.